Theatre Is Easy | Reviews | That's MISS FITS to You! That's MISS FITS to You! The cast of That's MISS FITS to You! Photo by Erik McGregor. BOTTOM LINE: That’s MISS FITS to You! is a loving tribute to drag, friendship, and love. Every so often, a show comes along that seems to defy categorization. Like its titular character, That’s MISS FITS to You! refuses to be fit into a box. 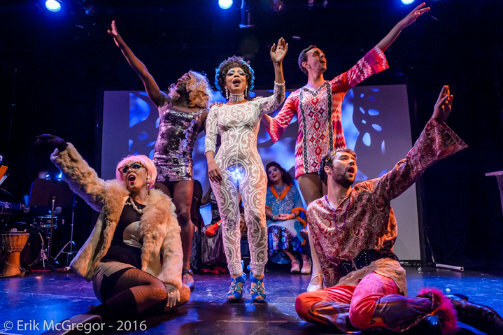 Neither traditional musical nor rock opera, it simultaneously manages to be drag show, revolutionary act, and glitter-covered eulogy. Guided by four fabulous divas, the narrative of That’s MISS FITS to You! looks backwards towards the 1960s, where civil rights, trans liberation, and mystical spiritualism convened to create a playground for the island of Miss Fits and her boys. The show opens with an interpretive murder ballet followed by a lyrical dirge explaining that Miss Fits (Dusty Shoulders) has died, the world becoming a little darker for her having left it. Miss Fits' four sister-boys Miss Conspiracy (Christopher Borg), Miss Alliteration (Darren Polito), Miss Counterpoint (Michael Lynch), and Miss Service Wo-Man (Todd Tif Fernandez), however, believe that their friend has been murdered, and go to the police. So begins a poly-gendered, elaborate journey to both honor their friend and share their joy. What comes next is a bit confusing and sometimes overwhelming, featuring 27 songs, multiple costume changes, and a number of character idiosyncrasies that make storytelling circuitous. For instance, the aptly named Miss Alliteration only speaks in alliterative sentences, which Polito sometimes seems so eager to dispatch they can hardly be understood. As Miss Conspiracy, Borg makes declaratory statements about power and the police that seem to come out of nowhere, and sometimes only serve to distract from the point. Todd Tif Fernandez—who also wrote and composed the show—plays Miss Service Wo-Man, who speaks and moves almost like a jester, bouncing around the stage wildly. However, these jarring choices can be forgiven thanks to the performers’ deep level of fearlessness and commitment. The show boldly declares its activism such that it is impossible not to join the fight. That’s MISS FITS to You! deserves praise both as a lovely, thoughtful exploration of gender, and as an oral history project about the trans liberation movement, notably featuring a reenactment of the Stonewall Inn protests that were principally led by trans women and drag queens. As Young Miss Fits, Kimberlyn Avon sings the particularly stirring musical numbers “Butterfly,” “I Was Confused,” and “Reflections of the Sky,” declaring her self-love and identity while also acknowledging the restrictive violence of binary gender roles. Avon’s voice is sweet and melancholy, evoking a sense that Miss Fits is both deeply wise and deeply pained. Enthusiastic and campy performances abound, particularly from Ursula Anderman (Young Miss Conspiracy) and Eduardo Uribe (Young Miss Alliteration). With bright, fun costumes by director Jonathan Warman and compelling projections by David Palmer, the show does a great job of transporting us throughout time and space, such that it isn’t all that unbelievable when we meet a Radical Faerie, or when ghost Judy Garland (Apryl Higgins) shows up serving full angel diva realness. In fact, the production seems to run on a fuel of sweat, feathers, and pure love, for their smiles shine brightly despite the three-hour running time and nearly constant singing and dancing. Though it runs long and could use some significant edits, the show is memorable for its campy sense of glee and the hard work of the performers. It may even inspire you to embrace life and explore your own multi-faceted identity. That’s MISS FITS to You! comes across as a labor of love, and despite some tarnish on its overall polish, still shines with enthusiasm and joie de vivre. That's MISS FITS to You! is by Todd Tif Fernandez. Directed and Choreographed by Jonathan Warman. Musical Direction by Terri Gorgone. Lighting and Projection Design by David Palmer. Costumes by Jonathan Warman. Production Stage Manager is Vanna Richardson. Associate Director is Brendan Leonard. Associate Choreography by Danny Durr. Additional Choreography by Jonathan Mendez, Summer Pilaf Minerva, and Danny Durr. General Manager Steve Asher. Produced by Giovanni Miranda and Todd Fernandez. The cast includes Jonathan Mendez, Walter Battistini, Kevin Garcia, Michael Teger, Mikael Short, Christopher Borg, Darren Polito, Michael Lynch, Todd Tif Fernandez, Kimberlyn Avon, Ursula Anderman, Eduardo Uribe, Dennis Williams aka Destiny Devine, Brendan Leonard, Apryl Higgins, and Dusty Shoulders.